We’ve all seen kids turn whisks into magic wands, and spoons into drum sticks, with nothing but their imagination. All the while, newly purchased toys sit dormant on floors and in closets. Moff creator Akinori Takahagi combines the best of both worlds with a colorful, wearable smart toy that supplements a child’s imaginary play. Snap Moff on a wrist, and it adds realistic sound effects to arm movements. Choose what the toy will be and your child’s motions are animated with the swoosh of a ninja sword, the crack of a baseball bat, the glistening sounds of magic dust, and more. 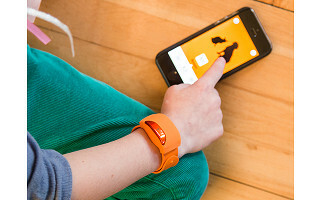 Simple enough for even the most Luddite adult, the band connects via Bluetooth to the free Moff app. The coin-cell battery provides up to 30 hours of play before needing a change. It’s a toy that won’t grow old until your kids do . . . and maybe not even then. Hi everyone! 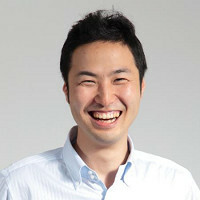 My name is Aki Takahagi and I'm the founder of Moff. We created a wearable smart toy that makes the sound of your child's imagination. I hope your family enjoys our Moff Bands. If you have any questions, I'd be happy to answer them! What a fun toy! What type of battery does it run on and how long does it last? And will it work with my iPhone 6 Plus? @Albert Hi! Thanks for asking. It's a coin battery and runs for 20 hours of continuous play. And yes, the Moff Band is compatible with all Apple iOS devices. Meaning, your iPhone 6 plus will work! @Akinori This is awesome. 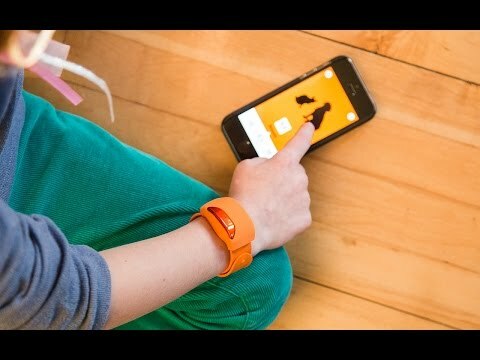 I've had friends with kids play with the Moff Band (they got it as a Kickstarter project) — the kids had so much fun! This toy really shows off the imagination of the kids and how they can truly make anything into a toy. Sometimes we adults underestimate the creative and imaginative capacity of kids. Moff brings this all out and it's a great toy! You know, I hear ya... but I am not thrilled about getting toddlers so attached to electronics so young. What's the matter with wielding a spoon and pretending it's a drumstick or magic wand or a tree branch sui generis? Will she be bored with what could be imaginative play if she doesn't get the super sound effects? Will she be able to even imagine play without an adult with an iPhone attached? Please rethink this. Hi Wendie, thanks for the comment. There's nothing wrong with just wielding a spoon or a tree branch, but Moff provides an enhancement of a kid's imagination and play. While a child doesn't need the super sound effects, it's tough to argue that they don't make playing more enjoyable. What's great about Moff is, it is not requiring undivided attention from kids. They interact with the device for a few seconds at a time simply to change the sound effects and then they are off playing and imagining this new game the sound has created. They can even play with other kids as more than one Moff can be hooked up to a device. Moff takes playing and imagining to new heights. @Wendie Thanks for your comment! I appreciate your thoughts/concerns. Our belief is that these days many young children are already spending much time on tablets, etc. 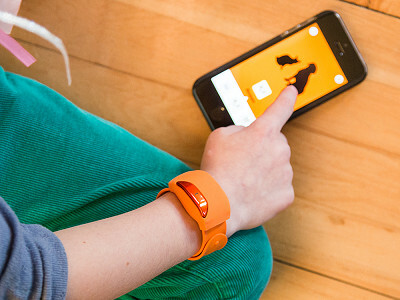 The Moff Band aims to embrace existing technology and get kids up and moving again! Our toy encourages social interaction, physical activity and the wonderful imagination that all children are born with. @Wendie I think this is a really neat invention, but I'm with you. @Erica This conversation sounds rather like the people who say "I don't know anything about art, but I know what I like." Stubborn and unfounded resistance to education and change. If an electronic device helps children do precisely the things that we think they should be doing, the what is the objection? If you have a legitimate objection, please let us know what it is. you have a great invention. there are so many invention start of companies which is the best way to get my invention soul and brought to market do I need a patent lawyer first? Hi Walt, Android availability is coming soon. Stay tuned! @Mike I would be ordering this right now if you had Android support right now. I am always frustrated by companies that launch products with only i* support. That's cutting out more than half of your potential market. I hope "coming soon" really means "soon", because in my experience that usually means months of waiting for an Android product... if it is ever released at all. Hi Grey, Akinori might be able to provide a more detailed timeline, but an Android version is on its way likely because of the reasons you mentioned above. @Grey I hear you on the Android issue. Here's the thing. When you are just starting you can't do everything well so focus is key. But ultimately all the learnings on IOS app usage will make the Android release even more polished. So while the waiting game is indeed frustrating-- it is better than not having a young company like Moff get started in the first place. @Grey We planned to launch the Android this month, but to be frank, we've not been able to achieve the level of reliability with the Bluetooth drivers. As you know, Android platform is supported by many different hardware vendors and models. We wanted to have the same user experience and ease of use with Bluetooth pairing and reliable connection across all the different brands — and that has proven to take longer than expected. So we definitely want to support Android and do it with the usability it deserves. Thanks for your support and interest in Moff! #1.} Does this work for the IPad 2? #2.} Is this ONLY for kids, or can adults use this also? @Steven @Mike Yes — "enjoyed by people of all ages is so true" — we have seen grandparents play with their grandchildren with the Moff Band! Hi, does the band come in other colors besides orange? Thank you. Hi Stephanie, currently the Moff is only available in orange. For more colors, stay tuned! Wow... I totally see the possibilities here for my students. I work with blind and visually impaired kids. I envision this set up as a basis for reinforcing correct cane usage. I don't know if it currently would fit that specific information, but any interest in tweaking it a bit to help kids get auditory feedback to consistently move the cane from side to side as they walk? In any case, you made a very cool product! @erin Imagination isn't just for kids... wonderful idea! Hi Erin, thanks for the comment. That is a very interesting idea. We always love to hear kind words about great products like these and it's even better when you hit us with something we never thought of. has anyone used this with a cognitively and physically delayed child? I would be willing to write a blog about such an experience if you are willing to do a 30 day free trial. We’ve all seen kids turn whisks into magic wands, and spoons into drum sticks, with nothing but their imagination. All the while, newly purchased toys sit dormant on floors and in closets. Moff creator Akinori Takahagi combines the best of both worlds with a colorful, wearable smart toy that supplements a child’s imaginary play. Snap Moff on a wrist, and it adds realistic sound effects to arm movements. Choose what the toy will be and your child’s motions are animated with the swoosh of a ninja sword, the crack of a baseball bat, the glistening sounds of magic dust, and more.